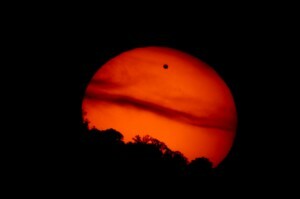 Transit of Venus – it’s happening tomorrow! Unless I’ve got the time difference wrong, the Transit of Venus is happening tomorrow! That’s where Venus crosses between us and the Sun, the rarest of all eclipses. The next one happens in 2117, over a century away, so don’t miss this one. Australians can see it on 6 June 2012 in the morning until about 2 pm. Like a Solar eclipse, you can’t look directly at the Sun to watch it happen, you need special glasses or to look at the shadow. Alternatively, watch the livestream on the RiAus website. Everything you need to know is at this page on the ABC website. The transit of Venus has a special importance to Australia, as Captain Cook first came to the area on scientific mission to record the transit from Tahiti. His second, secret mission was to search for the Great Southern Continent. Cook’s data and pictures allowed astronomers to measure the distance between the Earth and the Sun, getting a sense for the first time of how immense our Solar System is. Back in the 18th Century, it was all a bit of a mystery – one worthy of an Apollo-level international solution. People were sent around the world to get a different view of the transit, noting down when the transit started and when it ended. Then the data was compared, and used mathematically to see how far Venus was from the Sun. This is similar to pointing at a far away object with your finger, then recording how the image looks when only your left eye is open, and then how it looks when only your right eye is open. Go on, try it! Then try doing the same thing, but with your finger much closer to your face. Did you do it? Spoiler alert: Your finger seems to move much more when your finger is close-up. Substitute your face for Earth, your finger for Venus, and the distant object you’re point at for the Sun – and you have a pretty good idea for what they were going for. ‘Cept they used more maths!